Scary news out of the Bay Area... In Hayward, police are looking for a man who punched out a 70-year-old man at a crowded park, leaving him unconscious on the ground without help for over an hour. 70-year-old Wang Wei-Wang was picking up recyclables at Kennedy Park on August 31, when he somehow got into altercation with some partygoers in the picnic area. One of the men struck Wang in the head, knocking him unconscious to the ground, where he was left lying for an hour before his wife came looking for him. The group apparently continued to party on as Wang lay there unconscious, suffering significant brain trauma. There were approximately 10 to 20 people at this gathering, and nobody offered or bothered to help. 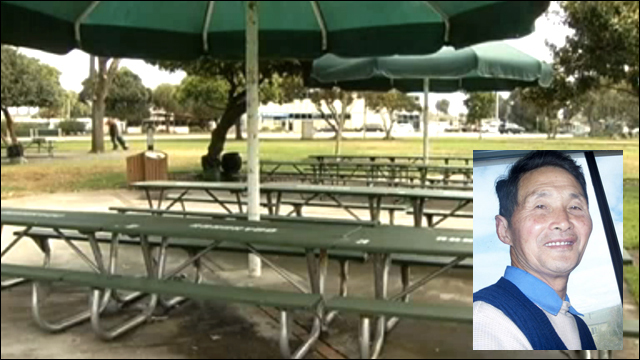 About 6:45 p.m. Sunday, police said, Wei-Wang entered the park's pavilion picnic area at 19501 Hesperian Blvd. to collect recyclables. At the same time, in the northeast area of the park near the horseshoe pit, a group of 10-20 adults was using the picnic area, possibly celebrating a birthday, Ormsby said. Wei-Wang was approached by a female from the group who engaged him in conversation, according to police. Moments later, a male believed to be also from the group approached Wei-Wang and punched him in the head with enough force to cause him to fall to the ground and lose consciousness, Ormsby said. Mr. Wang is still at the hospital in critical condition, and will likely suffer permanent brain damage. Meanwhile, police are looking for the man who punched Wang. The suspect is described as an African American man standing six feet tall and weighing about 200 pounds. He was last seen getting into a beige vehicle and driving away. Anyone with information about the case is asked to call Hayward Police at 510-293-7000 or the anonymous tip line at 510-293-7197.